It’s those 22 years between his first and latest major that make No. 15 the most popular of all. “Between then and now, these people have watched his every move — every difficult challenge, losing his game, coming back, private issues — and so they know a lot more about him as a person,” Finchem said. “People are just over the moon about this. Part of this has to do with how he’s handled himself the last two, three, four years. He’s been a very positive force, a leader among the players, and he’s at another level of interface with millions and millions of fans. Television ratings spiked following that 1997 victory, right when the PGA Tour was negotiating a new television contract. The total prize money on the PGA Tour in 1997 was $70.7 million, and it jumped to $135.8 million under the new TV deal in 1999. This year it’s at $340 million, not including FedEx Cup bonus money. It’s been that way since 1997, even during the lean years for Woods when his image was tarnished through tabloid stories of extramarital affairs, when his body began to break down and his glutes didn’t activate, when he returned too soon from his first back surgery and went five years without winning. When he wasn’t playing — Woods went two straight years without a tee time in the majors — the legend grew because all anyone had were memories, and those were far more powerful than anything he showed on the golf course. 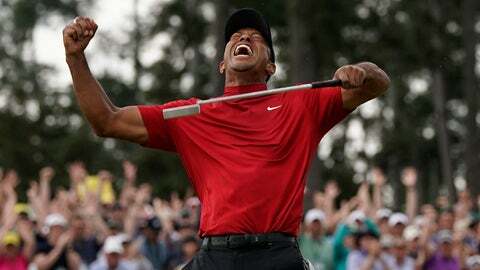 That’s why his latest Masters victory was so amazing to so many. “But now, it occurred to me looking back on it that in many ways, people love to watch him play golf, but they wanted to love him,” Finchem said. They missed him. Now they have him back, and for how much longer doesn’t matter as much as it once did.